many sport like swim ,snorkeling and diving. The departure of the "classic" way is in the heart of the town of Varzi, in the province of Pavia. From the car park overlooking the Staffora, follow the signs towards the bridge, then the path on the left. A wide path, first level, then of variable slope, will take you to Monteforte and then to Castellaro, periodically intersecting the asphalted provincial road and the local cart. At the end of the village, continue along a wide dirt road surrounded by woods until you meet the border between Lombardy and Piedmont. On the border line we continue on the ridge that will accompany us until 1700m of Mount Chiappo, where at the bar / shelter it is possible to have a rest before the descent to the Capanna di Cosola where the first stage ends with the overnight stay. 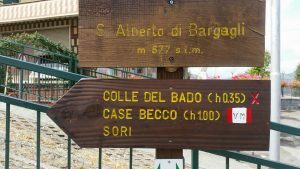 The second day of walking begins along another border: the one between Piedmont and Emilia, initially slightly downhill, first in a wooded area, then on the ridge overlooking the pastures below in a southerly direction. 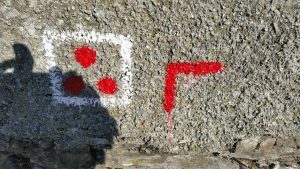 Once you have passed Monte Cavallaro, and the Carmo, the trail continues on the separation line between Liguria and Piedmont in the Antola park. 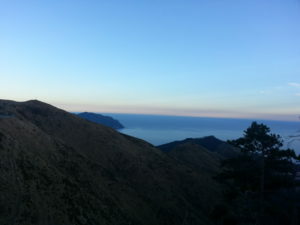 When you reach the top of the mountain, after a stop at the homonymous mountain hut CAI, continue steeply downhill towards Donetta and then Torriglia, where you can stay overnight. 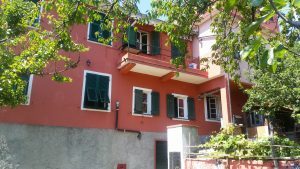 Recommended in Torriglia, in the village the Mulino del Lupo, a beautiful place where there is the possibility of horse riding excursions, while the B & B Villa Tiffany is for a stay right on the beautiful lake of Brugneto, heart of the Antola Park, more romantic! On the third day, after walking along the provincial road exiting from Torriglia, pass the Boffalora tunnel towards Monte Lavagnola on the right. When you are on the hill of Monte Lavagnola, you must go to the RIGHT towards the Scoffera pass and always follow the AVML path marked with the initials AVML, when the path forks, take on the left the one marked as VM (Via del Mare), always the blue signs (two blue dots on the stones) up to the asphalt road. Once in Case Becco (asphalted road with few cars) you walk left for 5 km to Colle Caprile from where you take the path 00 that you find going left, well signposted with the sign VM and from here to the Passo Casetti just above Uscio.go down on this beautiful path and after 15 minutes you have arrived in Uscio, take the asphalt road to the right and always follow the trail signs (3 red balls) that will lead you in 5 min to the B & B Rif.Uscio. Shortly after you arrive on the asphalt road and take a right to reach Ruta. 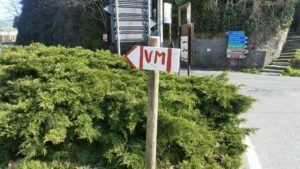 If you want to continue the VM path, go up towards the church of RUTA and enter the Parco di Portofino. From there to the summit of Monte di Portofino. Then easily descend to Pietre Strette and then to Portofino or San Fruttuoso, or Punta Chiappa where the clear water of the Park will welcome you for a refreshing dip in the deep blue.